The Pentagon announced Friday the capture of one of al Qaeda's most senior and most experienced operatives, an Iraqi who was trying to return to his native country when he was captured. Bryan Whitman, a Pentagon spokesman, said the captive is Abdul al-Hadi al-Iraqi. CBS News national security correspondent David Martin reports that he was actually captured months ago while crossing from Turkey into Iraq. "Until this week he was in CIA custody," Martin reports, "[in] so-called 'secret prisons' where these high-value detainees are interrogated using what's euphemistically called 'enhanced interrogation techniques' — which means, at the minimum, physical pressure is put on them to talk." CIA spokesman Paul Gimigliano called al-Iraqi "a veteran jihadist" and said his capture is "a significant victory in the fight against terror — getting him off the street is good news." The Pentagon described al-Iraqi as an associate of al Qaeda leader Osama bin Laden and as someone who may have been targeting Westerners outside of Iraq. At one time he served in the Iraqi military, the Pentagon said. CBS News consultant Michael Scheuer, a former CIA analyst, says al-Iraqi is a "major player." "He is a long-time al Qaeda member. He's a senior field commander and insurgent fighter, and has a great deal of experience in recruiting fighters and training them," Scheuer says. "He is likely to know a good deal about the organization about al Qaeda's fighters in Iraq, how they've been trained, how they're organized, how their armed, what their intentions are." 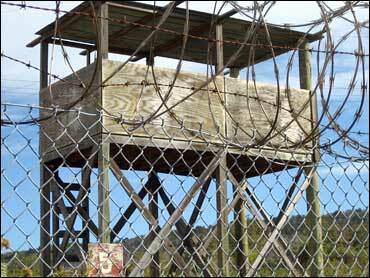 The Pentagon took custody of al-Iraqi at Guantanamo Bay, the detention center for terror suspects, Whitman said. He is the 15th so-called high-value detainee to be taken to Guantanamo Bay after being held by the CIA in secret prisons abroad. The other 14 were sent to Guantanamo Bay last September and have since undergone military hearings there to affirm their status as enemy combatants eligible for military trials. Whitman said al-Iraqi was believed responsible for plotting cross-border attacks from Pakistan on U.S. forces in Afghanistan, and that he led an effort to assassinate Pakistan's president, Gen. Pervez Musharraf, as well as unspecified officials of the United Nations. "Abd al-Hadi (al-Iraqi) was trying to return to his native country, Iraq, to manage al Qaeda's affairs and possibly focus on operations outside Iraq against Western targets," Whitman said, adding that the terror suspect met with al Qaeda members in Iran. He said he did not know when al-Iraqi was in Iran. In Pakistan, Interior Minister Aftab Khan Sherpao described the arrest of al-Iraqi as a "welcome development" but gave no indication that Pakistan played a role in it. A senior Pakistani intelligence official, speaking on condition of anonymity, said that al-Iraqi had operated from Pakistan's tribal regions but disappeared some time during mid-2005. The official said al-Iraqi had commanded al Qaeda forces when they fought U.S. forces in Afghanistan's Shah-e-Kot valley in March 2002. CIA Director Michael Hayden wrote in a note to agency employees Friday that the capture of al-Iraqi was "a significant victory" and that the CIA played "a key role in efforts to locate him," according to an agency official who saw the note. The Pentagon said al-Iraqi was born in Mosul, in northern Iraq, in 1961. Whitman said he was a key al Qaeda paramilitary leader in Afghanistan in the late 1990s, and during 2002-04, he led efforts to attack U.S. forces in Afghanistan with terrorist forces based in Pakistan. In August 2005, al-Iraqi appeared in a purported al Qaeda-made video that shows militants in Afghanistan — including Europeans, Arabs and others — preparing to attack U.S. troops and showing off what they said was a U.S. military laptop. Al-Iraqi, speaking in the video with a scarf hiding his face, said the U.S.-led wars in Afghanistan and Iraq have created "two fronts" for recruiting terrorists to the cause of bin Laden and Taliban leader Mullah Omar. Whitman said al-Iraqi was associated with leaders of other extremist groups allied with al Qaeda in Afghanistan and Pakistan, including the Taliban. He worked directly with the Taliban to determine lines of communication between Taliban and al Qaeda leaders in Afghanistan, specifically about the targeting of U.S. forces, the spokesman said. The Pentagon said al-Iraqi spent more than 15 years in Afghanistan and at one point was an instructor in an al Qaeda training camp there. Before the terrorist attacks of Sept. 11, 2001, he was a member of al Qaeda's ruling Shura Council, a now-defunct 10-person advisory body to bin Laden, the Pentagon said. He also was a member of al Qaeda's military committee, which oversaw terrorist and guerrilla operations and paramilitary training, according to the Pentagon.